With the popularity of Downton Abbey, all things charmingly vintage and elegantly English have a renewed appeal. (And for some us, such charm never went out of fashion!) 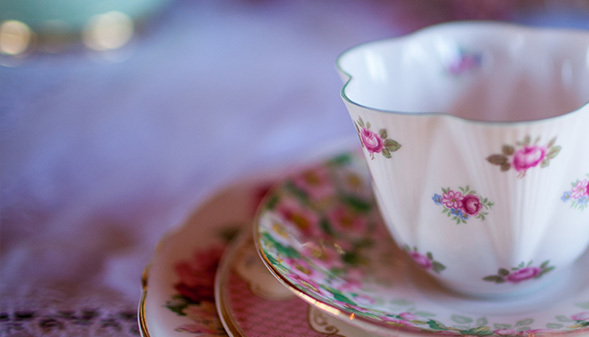 I recently met a delightful woman at a wedding event who has a clever new business; she rents out “vintage mismatched fine china” for special events—like for your bridesmaid luncheon or wedding reception. Vanessa Gilbreath is English, ‘natch, and the treasures you can rent are from sets of beautiful china she inherited from her mother, grandmother and great-aunt ... all reminiscent of English flower gardens. Wherever your inspiration comes from for your wedding, be sure to include the elegance and beauty that calls forth your delicious imagination as well as your royally open heart!